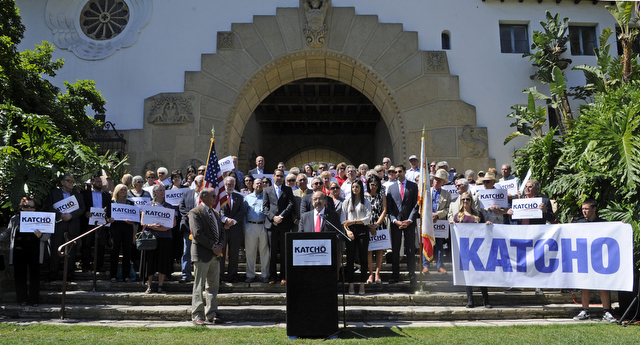 Assemblymember Katcho Achadjian announces at the Santa Barbara Courthouse that he is running for Congress. An immigrant from Lebanon who became the owner of a small chain of gas stations in San Luis Obispo, Achadjian is the epitome of the American Dream. Such was repeated on Friday by a number of area Republicans, including former congressional candidate and actor Chris Mitchum, who narrowly lost the election to Capps last fall. Other notables in the crowd, some hoisting signs that read “Katcho” in bold capital letters, were Supervisor Steve Lavagnino, Santa Barbara City Councilmembers Dale Francisco (who recently became chair of the Santa Barbara County Republican Party) and Frank Hotchkiss, former county party chair Gregory Gandrud, and retired politician Brooks Firestone. 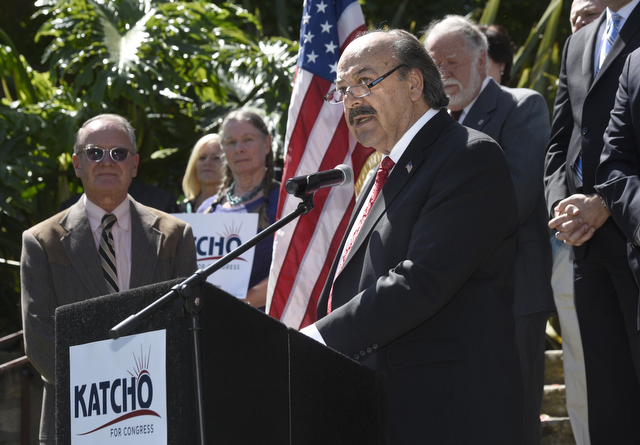 State Assemblyman Katcho Achadjian announces at the Santa Barbara County Courthouse that he will run for Lois Capps' 24th Congressional District seat in 2016 (April 17, 2015). “He has done it all,” Firestone said of Achadjian. An immigrant who speaks five languages and has an appreciation for what America stands for, Firestone said, Achadjian “has a true understanding of international issues.” He also spent four years on the California Coastal Commission and supporters noted that he cares about environmental issues. “I am fully aware that there is much work to be done,” Achadjian said, adding that the government today is not doing enough to make sure people can survive in this economy. Since 2010, Achadjian has served the state Assembly’s 35th district, which includes San Luis Obispo County and the northern tip of Santa Barbara County. He terms out in 2016. Republicans have a six-percentage point advantage in that district, with 21 percent of voters declining to state a party preference. In 1998, Achadjian won a seat on the San Luis Obispo County Board of Supervisors and served for 12 years. He will likely spend a fair amount of time campaigning in Santa Barbara. San Luis Obispo County makes up 43 percent of registered voters in the 24th congressional district. All of Santa Barbara County and a small chunk of Ventura County make up the rest. In that district, Democrats have a three percent advantage over Republicans and about 23 percent of people declined to state a party preference. Because 2016 is a presidential election year, the ballot is expected to attract liberal voters. Justin Fareed, the 27-year-old Republican candidate who lost in the primaries for the congressional seat last year, has joined the race again. Also vying to succeed Capps are Democrats Supervisor Salud Carbajal and Santa Barbara Mayor Helene Schneider, who both announced last week that they are running. Much speculation has circulated about whether or not Capps’s daughter, Laura Capps, will enter as well. Laura Capps told this paper this week that she is “seriously thinking about running for Congress” and will announce her decision soon. Fundraising will be a key factor in this race. Achadjian and Carbajal both said up to $5 million will be needed to run their campaigns.